It is hard to make sense of the reactions to the announcement that the United States will henceforth recognize Jerusalem as Israel’s capital. On the one hand, the decision was forecast well in advance, not just in the campaign, but also by other decisions by the present administration. As such, the reactions seem to have had an almost pro forma aspect to them. Even the protest in the West Bank and Gaza are hard to distinguish from the normal pattern of life there. At the same time, however, the language of the response has reiterated just how great the gap is between the way Americans in general, and the United States, perceive the Israeli-Palestinian issue, and how much of Europe does. That gap is not new, and it is marked by incomprehensibility on both sides. Americans and Israelis, with substantial justification, view the support given the Palestinian cause and the emotional place it has come to occupy among Arab nationalists, Muslim activists, and left-wing issue groups around the world, as a sign of a double standard indicative of anti-semitism. Foreign incomprehension of American support for Israel, in turn, reinforces such suspicions. Unable to grasp how anyone could see the issue so differently, the temptation is to resort to conspiracy theories about “Pro-Israel/Jewish” money, featuring figures like Sheldon Adelson, which ignores that there is no need for money to influence politics when most Republicans, and most voters, already hold such positions. The reality is that American politics, at least until the last few years, has lacked the ingredients that have produced support for the Palestinian cause in Europe. First and foremost, there is little to no sense of colonial guilt, and guilt based American anti-Americanism has historically been relegated to a political fringe even on the Left. If such views have in recent years achieved widespread currency in online outlets like Vox or Salon, they have yet to even begin to penetrate Republican politics. America is a force for good, as are its allies, and it therefore has nothing to apologize for on net, so goes the consensus. Nor is there is a substantial alienated Arab and/or Muslim population. The focus on the proposed “Muslim” travel ban has distracted attention from the greatest divergence from Europe. Not only is there a much smaller Muslim population, but it tends to look little or nothing like that in Europe. Much of the American Muslim population is made up of descendants of African American converts, while unlike Europe, much of the remainder is richer than the average American, made up of refugees, such as those from Iran’s revolution, with little affection for Islamic politics. At the same time, a large portion of the Arab population is made up of Christians, and there is little love lost between them and the Islamic Arabs who drove them from home. It is no coincidence America’s most prominent Palestinian politicians, the Sununu Dynasty and Jeanne Shaheen, all from New Hampshire, were Christian as was Arab-American former Michigan Senator Spencer Abraham. As such, unlike Europe where the Palestinian cause functions as a proxy for Arab/Islamic nationalism, and where colonial guilt precludes any push-back by the majority, neither factor exists. Finally, there is the tendency to view conflicts not as abstract morality tales, but rather as problem solving exercises. A legacy of America’s long tradition of isolationism, interventions abroad of any form are viewed from the perspective of American interests, and often perceived as charity. As a result, wars in Afghanistan, Iraq, and Vietnam became unpopular not because of high numbers of civilian deaths, but rather because continued fighting became perceived as “ingratitude” by much of the American electorate. No one has done a worse job playing to this sentiment than the Palestinians, who are perceived as having received an enormous investment of time, that most valuable American resource in the eyes of the domestic electorate, and yet seem to be more anti-American today than thirty years ago. These factors make the American attitude to the Israeli-Palestinian conflict distinct from those in Europe, and therefore there is some truth to the charges that the US is not a neutral broker. But the US has never purported to be neutral. What the US has claimed to be is honest, including about its positions and interests. That is because, the United States, uniquely is actually invested by self-interest in resolving the conflict, since the sympathies of the elite and public with Israel coexist with the need for alliances in the Arab and Islamic world. As such, nothing would enhance the United States’ interests in the region than a mutually agreeable settlement. By contrast, other actors, especially Europeans are only invested on one side. European states have a substantial population which is partisan on the side of the Palestinians with the rest varyingly apathetic, guilt-ridden, or opposed to Israel from general anti-American left-wing solidarity. Israel’s only reliable allies in the political system are all too often far-right parties operating on the principal of “the enemy of my enemy is my friend” and struggle to hide anti-semitism. As such, it is no surprise European governments tend to err on the side of appeasing Pro-Palestinian sentiment, with the same true in much of the rest of the world. In something of an irony, this has been a mixed blessing at best for the Palestinians. The greatest obstacle to any agreement has always been less Israeli intransigence and more the unrealistic expectations fostered by the Palestinian leadership among the population, with the consequence that any plausible deal looks like a treasonous sellout. This is exacerbated by international statements of solidarity from powers that are indifferent if not irrelevant such as the EU and UN. When they declare the settlements illegal, or claim the status of Jerusalem is disputed, they encourage Palestinians to believe that if they hold out for more the international community will rescue them. Jerusalem is a prime example. The simple fact is that Israel controls it, and will not give it up, and for good reason. Between 1948 and 1967 when the city was under Arab rule, no Jews were allowed to visit the Temple Mount, and the areas returned to Palestinian rule since Oslo have become no-go areas for Jews since. It is virtually a fact that any locations turned over to Palestinian rule will be out of bounds for Jews, and therefore it is impossible for any locations important to Jews to be turned over to it. UN Administration is a shibboleth. UN peacekeepers have been ineffective in enforcing their own agreements in every single previous experience, whether in Sinai, Lebanon, or Gaza, and every resolution reinforces that. Equally true, is that Americans mostly agree with these arguments, and there is no chance of the US forcing Israel to yield. Therefore any agreement would require the Palestinians to yield on the status of Jerusalem, including East Jerusalem. What the American recognition of Jerusalem as part of Israel does is move that issue from the process itself, where it has been able to consistently wreck it, to a prerequisite for such talks to take place. 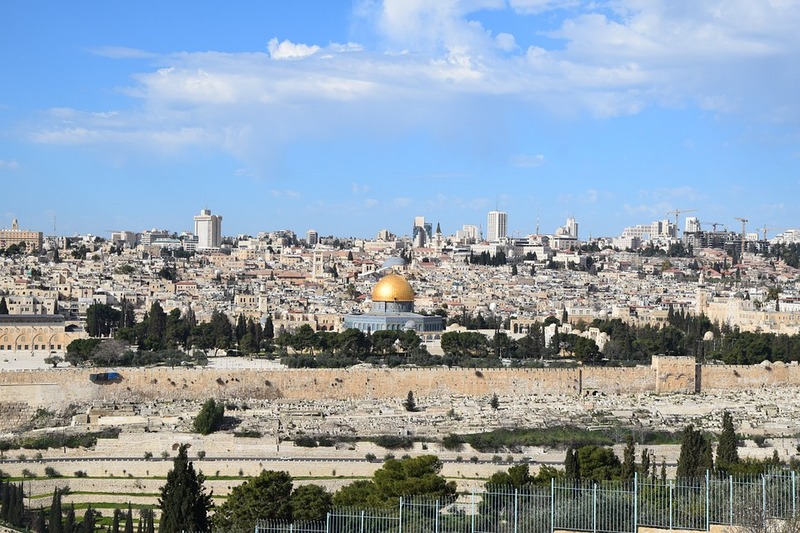 It may make “talks” less likely, but almost certainly does not make a deal any harder to reach, since any “talks” it would preempt would have collapsed anyway over the status of Jerusalem. What it does is it forces the Palestinian leadership to explain to their population what any viable deal will have to look like, and therefore places the ball in their court to tell America and Israel when they are ready to deal. It is of course possible they won’t, at least for a while. And here the international reaction matters. The EU cannot do anything to advance Palestinian claims, nor is it likely it has any interest in doing so. But statements of support for Palestinian claims from EU officials, or the UN can be used by Palestinians to convince themselves that Jerusalem is up for debate, and that therefore they don’t have to make any real concessions, or accept a settlement which reflects the facts on the ground, ie. Overwhelming Israeli superiority. That would be tragic, but par for course. The American action will only harm the Peace Process to the extent the process itself has value absent peace. America may appear as less of a neutral mediator, but that is not a bad thing if it makes it even clearer that what America is putting itself forward as is an honest broker. It is tragic Palestine’s “friends” in Europe or the UN won’t tell them the same truths.